And then there were two - nothing changed and everything had changed. I first met this family a year and a half ago during their son’s Newborn photos. Carolyn contacted me and said they were looking for in-home, relaxed photos to capture their new little baby. I ended up loving their photos so much, that you’ll often see them in my marketing. On Saturday, I got to hang out with them again. It was the same house, the same parents, the same poses, the same dog who wasn’t sure he wanted to be in photos, but there was another new human with us also this time....as well as a little boy who had just become a big brother! The amazingness of how quickly little one’s grow is never lost on me. The last time I was in their house, Jack was being swaddled and held, and everyone was growing into their new roles. Mom had only given birth ten days prior, and was learning everything about her new baby as well as how to be a mother. There were a lot more questions then, like “…maybe he’s hungry? Does he need to be changed?”…and such awe at every little expression. This time around, little Annie was only 11 days old and you can tell that Mom and Dad have had some practice! They know the things that make her fuss. They’re able to change her onesie and help Jack learn how to be gentle around a new baby. 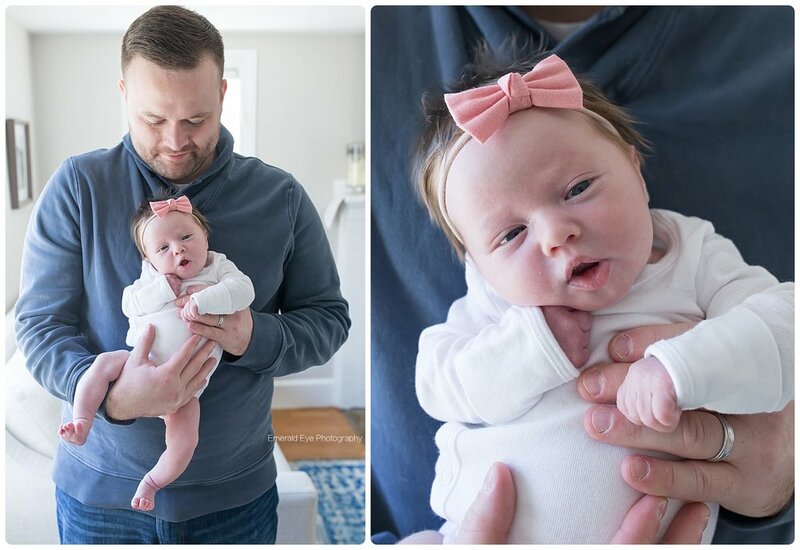 They’ve figured out how to wrangle a little guy and a newborn - and they still have found ways to take in all of her little smiles. There was one particular moment during their session, when it was just the two of them holding Annie, that really caught me by surprise. I looked through my camera and saw the exact same photos that I had taken of Jack. Same parents, same pose, same love, just another new little human...and it made we wonder if they could feel how everything was just a little bit different, but still the same. I’m always so honored when families allow me into their home during the vulnerable time of learning how to become a parent - even if they already have a child! Little Annie has big shoes to fill if she follows in her brother’s footsteps. Jack is curious, playful, and very sweet...and I’m sure it learned it all from his parents. Thank you so much for letting me document this time for you - I can’t wait to see your children grow! Are you interested in your own Newborn Lifestyle session? Check out all of the info here or send me a quick email to schedule!